The Intel 1601 is a 256 bit PROM that was designed to be drop-in compatible with Intel's 1301 metal mask ROM. 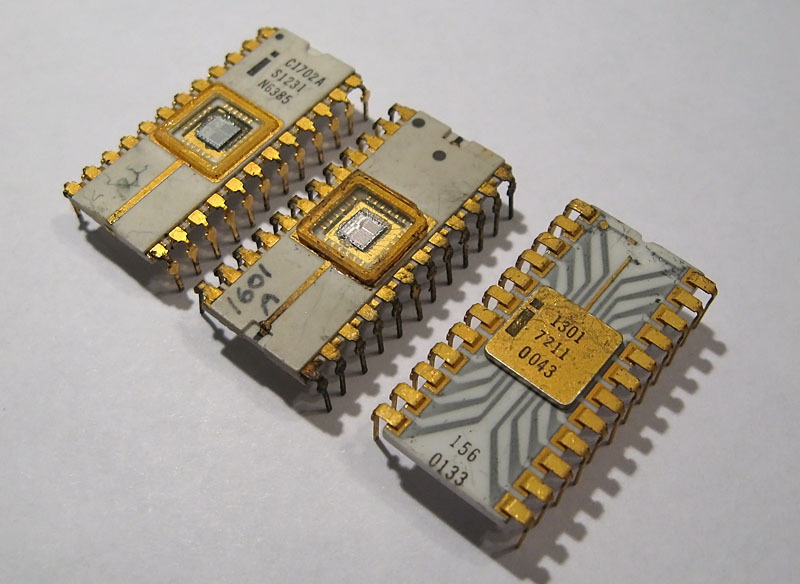 A 1601 PROM has a significant advantage over the 1301; in that it can be programmed electronically by the end user without the need for factory-applied masks. 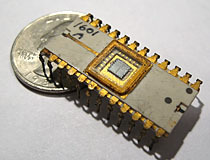 Released in 1970, the earliest versions of this chip have opaque gold lids and gray trace ceramic packages. Later versions were simply 1701 UV erasable EPROMS with black vinyl covering up the UV erase window. Unfortunately the black vinyl cover, which has the part number printed on it, has long since fallen away on this example. With the cover removed late model 1601's are basically indistinguishable from an Intel 1701; it is likely that at least a few unidentified 1601s are sitting in chip collections around the world. Intel 1601 PROM, at rest. Normally this IC would have a black cover over the glass to prevent erasure of the chip's contents. Intel first generation ROM family. From left to right; Intel 1702 EPROM, Intel 1601 ROM, Intel 1301 mask ROM.